With back to school in full swing, I’m focusing on the mobile device struggle that I have openly shared here before with my girls. That struggle is how my girls have become more reliant on their iPads as they are growing up. It seems that what started out a few years back as a fun way for my pre-school age kids to learn their letters, numbers and more has turned into a way for both now elementary school aged girls to escape reality with games, YouTube videos, and more. While I tried to keep iPad usage down this past summer, I also was more lax at times. But for back to school, I am reminding my kids of some basic rules for their mobile devices. I also am confident that this struggle isn’t just in our home after conversing with other moms of kids. So, I am sharing some ways to help monitor, as well as to help them be more responsible with their mobile device usage. I have discussed this before. But there are most definitely times, when kids shouldn’t use their mobile devices. These times include meal or family time. But also, I don’t want my own kids on their devices before they are going to school. Plus, I don’t want them on their mobile devices during homework or bed time. So, I feel it is necessary to lay out the times when their mobile devices are definitely off limits. I also make sure to set limits on how much time they are allowed to be on these devices. Still, I can also be flexible when responding to my kids behaviors or needs. For instance, if I notice that my kids are grumpy, tired and just over-stimulated. This is when I’d be more inclined to limit their time with their iPads. Still there might be other times, as well. This includes when they have very little homework, have completed all chores, and/or overall just behaving appropriately. At times like these conversely, I’d allow them an extra 20-30 minutes of iPad time as a reward for good behavior. I mentioned that when my kids were younger, I allowed them to use iPads or other mobile technology. This was to help them learn the basics, such as counting and letters. I still encourage my own kids now to use these types of devices if it helps them with a specific topic for school or even a homework assignment. See as much as we can fight using technology. We also can’t deny that that these mobile devices can be more helpful than detrimental in helping young kids with learning. For these times, I am there to monitor what my own kids are finding in these types of searches. Again, a big key with kids using mobile devices is being a responsible parent. In being accountable, I not only make sure to do all that I have shared above so far. But also empower my children to become smart digital citizens in an increasingly connected world. See I monitor and keep an open line of communication with their mobile device usage. But how exactly do I do this? I do this by creating a Smart Talk agreement with my kids. Because this allows me to put our family internet rules in writing. What is The Smart Talk? 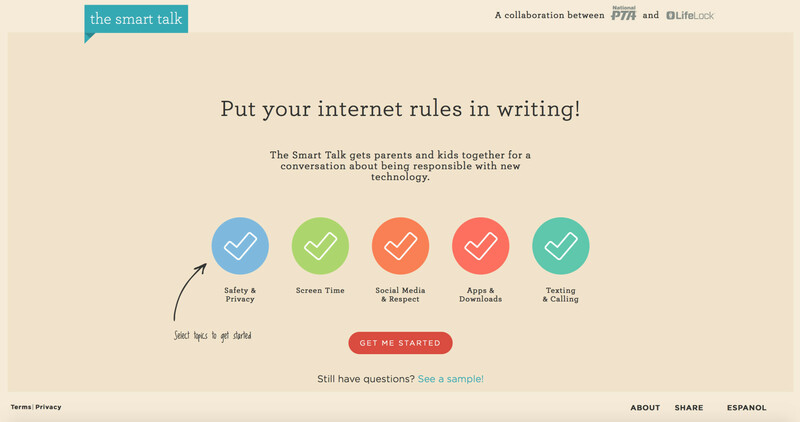 The Smart Talk was created by National PTA and LifeLock. It is a free, online tool. It also helps families set ground rules for technology use. Plus it promotes having open, ongoing conversations about online safety and responsibility. How does The Smart Talk work? The Smart Talk is a contractual agreement in nature. It engages kids and parents in an interactive experience, leading them through a guided conversation about online safety and privacy; screen time; apps and downloads; texting and calling; and social media and respect. This tool creates a printable contract to hold the parent and child accountable. Can The Smart Talk be changed or modified? Yes! See the Smart Talk can be revisited over time to keep the conversation going. Plus, it evolves as your kids age and even as technology changes. So there you have it. Four easy ways to help with back to school and mobile device usage with you kids. How will you set limits with your kids, mobile devices and back to school? 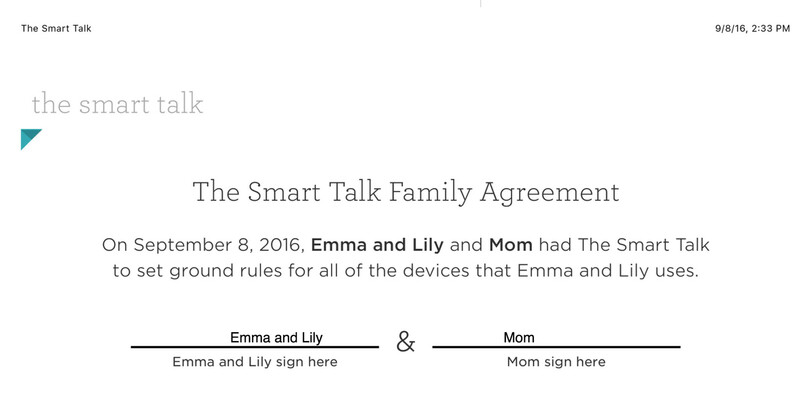 Will you Create a Smart Talk agreement with your child for back to school? Smart tips! And needed! Things have gotten better with back to school, but we definitely need to get some clear expectations for screen time in place. Appreciate this–perfect timing! Aw, my pleasure and I know with back to school we were most definitely in need, as well!! 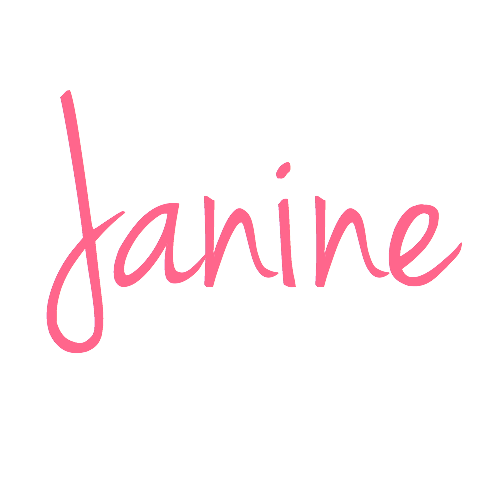 Great tips, Janine! Thank God they don’t apply to me. LOL Happy Monday! Thanks for these great tips!!! The one thing I insist on is no devices at the table, and no devices in the car. Also homework first. I will say that I do love how certain apps and videos have really brought my three kids, whose ages are far apart, 17, 14 and 11. They find things that each other loves and enjoy it together. But it is a struggle to get them to put their devices down. But it’s also a struggle for me!! Lol! Thanks Gingi and I agree that this is just something that is current and needs to be addressed in many homes now, too. I need to use a few of these tips myself. My kids all have cell phones except for Madison and I have to admit that I don’t set limits. I need to, especially during the school week. I’ve heard a lot about LifeLock but have never thought about using it. I’ll have to look into it more. Glad you are going to look into LifeLock and agree that this is an essential step and help for school weeks with kids and mobile devices, too. I love the tips! My daughter is still little, but something to think about. And being flexible is definitely important! Glad that I gave you some food for thought and agree about being flexible, too!! First, I should get Lifelock, lol. Second, the mobile device thing and kids is an interesting topic/debate. I LOVE my devices! Hehe. But I never thought about kids using them until I taught at a school that highly discouraged their use until middle school. Apparently the CEO of Google and Bill Gates did the same with their kiddos. Now, in my after school, the kids use iPads, BUT, they are not allowed to “just play” on them: they are for homework and “club” use only – “club” meaning they can use them to “play music” in music club or for graphic arts design club. Great tips and am definitely going to be trying this out in my own home! Thank you so much for sharing with the #happynowlinkup!! The first iPad came out when Christopher was five and I swear it was a lifesaver sometimes to keep him occupied while I did something else. His own personal device though is a Kindle Fire and at first I had the wifi disconnect at a certain time when he should be sleep. We made a verbal trust agreement about responsibility over the summer and what’s inappropriate to look at etc. I like the idea of the LifeLock agreement. Love that you and Christopher had a verbal agreement and sounds like you were onto something, as it is very similar to LifeLock’s concept. This is very important! Reiko has been spending so much time playing games in the computer. Sometimes he would watch YouTube on my phone. He does know when it’s time for me to work and use the computer but sometimes would be whiny before giving up. Rules are definitely important. Haven’t thought of some type of a contract yet though. I’ll see if it works for him at this age. Thanks for sharing! Smart tips… Every parents should know this. I totally agree with your Mobile device rules. As parents, we have to set some guidelines for our kids. I always love seeing your girls pictures. What cuties! 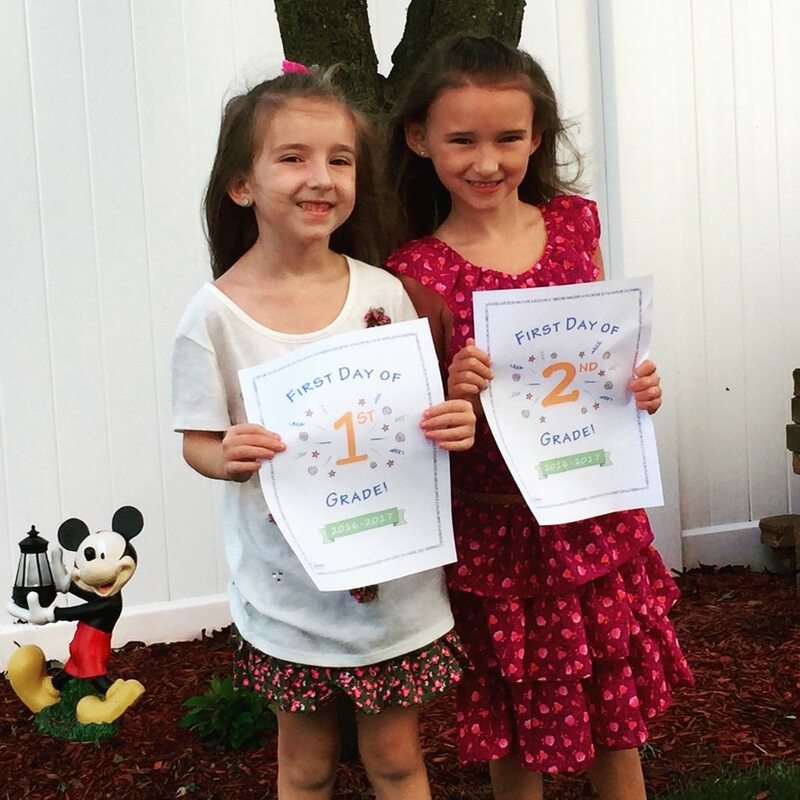 You will cherish this first day of school pics for a lifetime. I love Smart Talk, Chris and honestly as soon as I heard about it knew I had to try out and also share here for all my readers as it is just a brilliant way to help in this day and age with mobile usage for all kids! We let Eve watch PBS videos on our tablet occasionally and I’ve noticed her asking for it more and more lately. It’s amazing how quickly that privilege becomes something they want to do all the time! I like the idea of coming up with an agreement together as she gets older. Thanks for sharing! My kids think I”m evil that I don’t let them inline on school nights. But I don’t monitor it that much on weekends, so that’s the trade off. My daughter just got her first cell phone and we’re learning the ropes and rules on that one now. I am dreading the first cell phone here and I am just glad that there are things out there, such this to help when that time comes here, as well now.